A leaked photo has revealed what we can expect Will Smith’s Genie to look like in the upcoming adaptation of Aladdin. Disney have been rather busy working on live-action remakes of their classic animated films, including Beauty and the Beast, The Lion King, Dumbo and Aladdin. Unfortunately though, what we’ve seen so far of 2019’s Aladdin, has been disappointing fans across the world. Then, there were the first official images, published in December by Entertainment Weekly. While fans thought Aladdin and Jasmine (played by Mena Massoud and Naomi Scott respectively), looked great, they were less impressed by Smith’s Genie – the main concern being how ‘panto’ he looked. 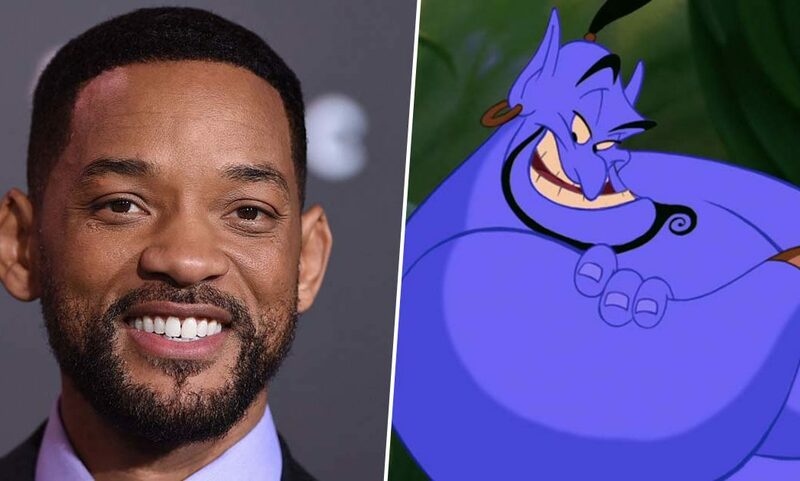 Disney didn’t show Smith as the iconic blue, jolly version of Genie, who was voiced by the late great Robin Williams in the original animation. That’s because they want to continue to tease Aladdin fans who’d like to know what Smith’s Genie will look like when he is blue. However, a leaked photo has given us a clue, showing a sketch of what’s thought to be Smith, flexing his muscles as he comes out of the lamp. Posted to Instagram by user ‘la_stregatta_luna’, the image is taken from a mug Disney have reportedly made, to sell alongside the film. The blue mug reads ‘at your service’ and features the image of Smith as Genie. To be honest, I found it quite underwhelming. However, the live-action adaptation is directed by Guy Ritchie, who did such a smashing job with the Robert Downey Jr. Sherlock Holmes films. The great thing about the role of the Genie is that it’s essentially a hyperbole for who that individual actor is, so it’s a wonderful platform and tapestry for an actor to fill his boots on. Smith does have big shoes to fill though as Williams’ Genie is so beloved. Whenever you’re doing things that are iconic, it’s always terrifying. The question is always: Where was there meat left on the bone? Robin didn’t leave a lot of meat on the bone with the character. Although Aladdin doesn’t look promising as yet, we hope Disney have a treat in store for us when the film is finally released. Get ready to enter a whole new world as Aladdin is set for release May 24, 2019.